Wassily Kandinsky's 1909 work Picture with Houses is in the Stedelijk Museum. A Jewish family claims it was a required in a forced sale after the Nazi invasion. More than 75 years after the Nazis looted Europe, descendants of their Jewish victims continue to pursue art they say was stolen from their families. On Thursday, a Dutch tribunal ruled, saying that an early painting by Wassily Kandinsky should remain at Amsterdam’s Stedelijk Museum. The 1909 work Picture with Houses has been valued at more than 20 million euros (US$23 million), and is being claimed by descendants of Emanuel Lewenstein, a Dutch-Jewish manufacturer of sewing machines whose art collection included the painting before the German invasion of the Netherlands in May 1940. Another 1909 Kandinsky went for US$26 million at Sotheby’s in 2017. Several years ago, three of Lewenstein’s descendants put their claim before a committee established in The Hague to consider World War II restitution claims for art in public collections. They said the Stedelijk Museum had acquired the painting in a forced sale—for the current equivalent of just 1,100 euros—five months after the German invasion and well after most of the Lewenstein family had fled the Netherlands. But in Thursday’s ruling, the Restitutions Committee concluded that the painting had not been stolen or confiscated, but rather that the Lewenstein family had sold the work in October 1940 because of their worsening financial circumstances. For decades, no claim was made for the painting, wrote the committee. The decision also notes the art-historical value of the painting, which the museum considers an essential part of its permanent collection. 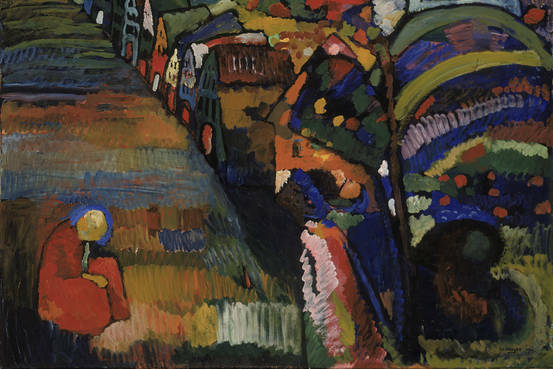 With its recognizable human figures and houses, the 1909 oil painting represents Kandinsky’s Fauvist phase in his evolution from impressionistic beginnings to his mature abstract style. European countries have become unsympathetic to restitution claims in recent years, he says, after a period in which they’d been more receptive. Palmer says the family may go to court to seek annulment of the committee’s ruling. The committee’s deliberations offer a kind of extra-legal arbitration, available since 2002—after the Dutch statute of limitations had expired on most Nazi looting claims. Through 2016, the committee had made 133 findings; 80 of them favored the claimants, in full or part. Since the Stedelijk Museum is part of the city of Amsterdam, it is the city council that fought the Lewensteins’ claim. On Wednesday, city spokeswoman Lisa den Oudendammer pointed out that the parties had agreed to be bound by the Restitutions Committee opinion.